York Machine offers comprehensive engineering design services. Our mechanical engineering team can help you transform your ideas from a hand sketch, to 2D drawings and 3D models. Our experience extends from design for manufacturing, to designing for our in-house rapid prototyping/3D printing. Furthermore we can help you specify and source components as well as reverse engineer obsolete parts so our machine shop can produce your hard-to-get spare parts. We use SolidWorks, a state of the art CAD software that allows us to create virtual prototypes while analyzing designs using motion and stress simulation. Our electronics team has the knowledge and resources to support you with everything from electrical and PCB design, to microcontroller programming and user interface design. 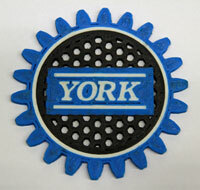 York Machine can also provide custom parts using 3D printing. Invent your own custom 3D model and we can print it. Broken knobs, switches, buttons, etc. on your old car or bike can be repaired with a 3D printed part. Prototypes, miniature architectural models of your building, custom jigs or fixtures, or house hold gadgets can all be printed. If designing a 3D part is out of your range of capabilities, have one of our technicians design your idea and we can print it.